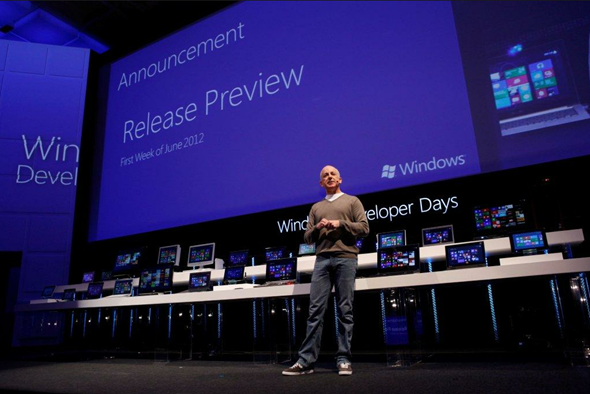 The Release Preview of Windows 8 will be released in June, it has been confirmed by Microsoft today. Subsequently, the final version will be signed off and released to PC manufacturers at the same time, which suggests the retail date could arrive as early as September. Steven Sinofsky, head of the Windows team, made the announcement at Windows 8 Developer Days in Japan, and the news was then tweeted through to the masses via Microsoft’s Building Windows 8 Twitter page. The Consumer Preview was only released in February, and the general consensus is that consumers have been impressed with what they’ve experienced hitherto. Sure, the Metro UI is inarguably better suited to tablets, but the whole OS seems faster and smoother than preceding versions. Of course, there’s always room for improvement, and shutting down the desktop seems a little more involved than we would perhaps like, but all in all, it’s been a very stable release. Indeed, twice as many consumers jumped on the Windows 8 consumer preview as they did with Windows 7 beta, and according to Sinofsky, "millions of people [are] using [it] everyday." The Redmond-based software maker – in-keeping with the theme of making naming alterations – seems to have broken the mold in titling what we believe is usually referred to as the Release Candidate. Unfortunately, no more details have actually been revealed, but if we compare what Microsoft has released up until now compared with times passed, the version to be released in June will be the Windows release to manufacturing (RTM) code – a complete version which can then begin distribution to partners and manufacturers. Some believe September will see the official release, while others are safely suggesting October. One would suspect, given that an October release has become something of a tradition for Steve Ballmer’s company, that the latter will be true. Although since there’s usually a two or three month gap between the RTM and the official launch, maybe – if this is indeed the RTM – the October estimate is a little generous. Whatever the case, Microsoft has put a lot of effort into its time management, PR and development, so it will be interesting to see of the momentum will carry through to the finish line.